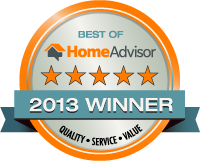 We were notified today that we have been selected as a winner of the 2013 Best of HomeAdvisor Award. We were chosen for this award because we exemplify quality work practices, premier service, and are a valued resource for home improvement excellence. Only the top pros in their network have been honored with this award. First and foremost we would like to thank our customers for the opportunity to assist them with their gutter and gutter debris issues, because without them and their wonderful reviews we could not have been selected for this honor.